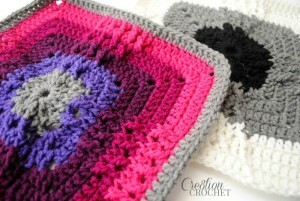 Crochet this gorgeous 12″ afghan square in any color combo to match your house. Personally, I love the black, gray and white, but the cheerful colors are awesome too! The pattern recommends a worsted weight yarn and an I crochet hook.